so adorable. i think he looks like marty in that picture. your little boy is adorable! it makes me want to have one of my own... sigh. what a perfect quote! i love it. what an adorable little bundle!! I want to eat him with a spoon he is such perfection. 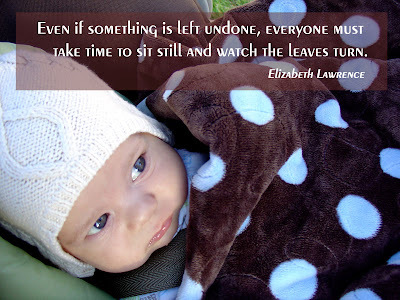 And there are plenty of undone things at my house right now--because I'd rather watch the leaves turn. What a perfect quote and an even more perfect little baby. What a cute baby boy in a cute poka dot blanket! Love the quote! This picture of you little one DOES look like your Mom! It's amazing how so many different people can be seen in one perfect little face! I KNEW it! No wonder I see such sparks of darling-ness in this little guy! mart your little guy is so cute. i want to snuggle him. he's so cute. i love his wee knit cap too! benji is just too cute for words. can i ask you where that blanket is from. i'm looking for some new goodies for photo taking when the new babe arrives!